MALIBU, Calif.--(BUSINESS WIRE)--Christina Real Estate Investors 2, LLC (“Christina 2”) announced today that it acquired Crescent Hill Lofts, a 19-unit multi-family project located at 1216 North Crescent Heights Boulevard in West Hollywood, California. Crescent Hill Lofts is a courtyard style multi-story building situated on a large land parcel with secured subterranean parking. The project was extensively renovated in 2016. 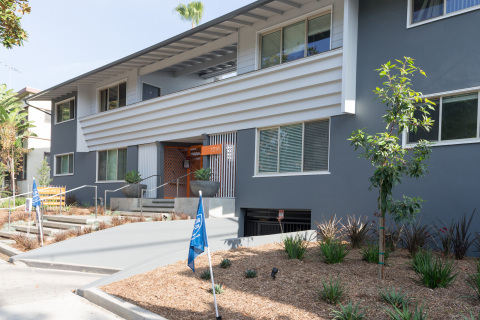 The landscaping, common areas and apartment interiors were re-designed by noted Los Angeles architect, Ramsey Daham, AIA. The Company is a private real estate investment, development and property management company founded in 1977 and headquartered in Malibu, California. Since its inception, the Company has specialized in acquiring, developing, redeveloping, and operating investment grade residential and commercial income producing properties in the prime sub-markets of West Los Angeles, California including Beverly Hills, Brentwood, Century City, Malibu, Santa Monica, Westwood, West Hollywood, and Venice/Silicon Beach. On November 21, 2013, the Company launched Christina Real Estate Investors 1, LLC (“Christina 1”). The investment objective of Christina 1 is to achieve superior tax advantaged returns by acquiring and operating a diversified mix of underperforming or undervalued properties in prime sub-markets of West Los Angeles, California. The current portfolio consists of six investments. On September 1, 2016, Christina launched Christina 2. The current portfolio consists of three investments. Christina 2 follows the same successful investment strategies as Christina 1 and is currently open for investment by accredited investors. If you would like to participate in Christina 2, please contact investor relations at ir@christinadevelopment.com.